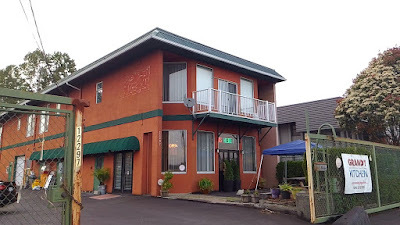 Located just off the Pattullo Bridge by Highway 17, Grandt Kitchen is not really in the middle of nowhere, but it's definitely not a place easy to find or easy to get to. Thank goodness Buddha Boy is good with directions, I would never be able to find this place on my own, even with GPS. As we parked our car and walked towards the entrance, one of the owners opened the door and greeted us. As soon as we sat down, another owner came by the table and asked how we knew about their restaurant. During our visit, most of the owners dropped by our table and introduced themselves. This friendly gesture has made us felt welcomed. Not only we were attracting the eyes of the owners, a large group of Filipino diners (we assume they're friends/relatives of the owners) were also paying attention to us...they must be wondering how this fat couple knows about this place? LOL! Now to the food. Our first dish was Tokwa at Baboy (tofu, deep fried pork belly, onions in soy sauce and vinegar). 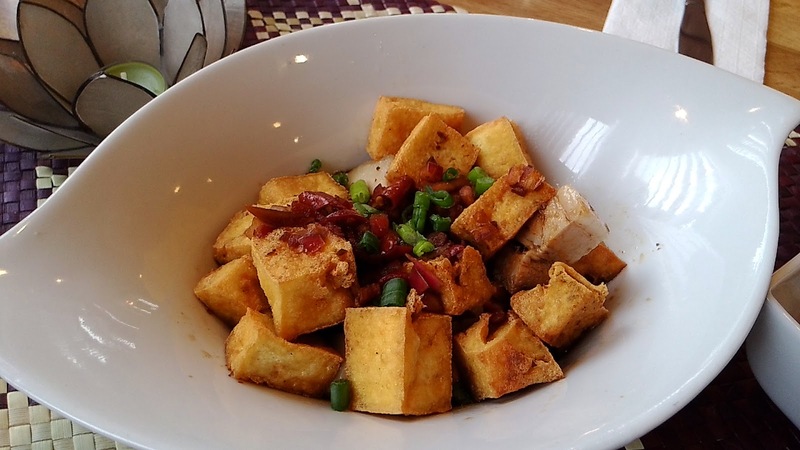 With an extremely crispy outer coat, the deep fried tofu kept its moist inner texture and retained the tofu fragrance that's often lost after deep fried. 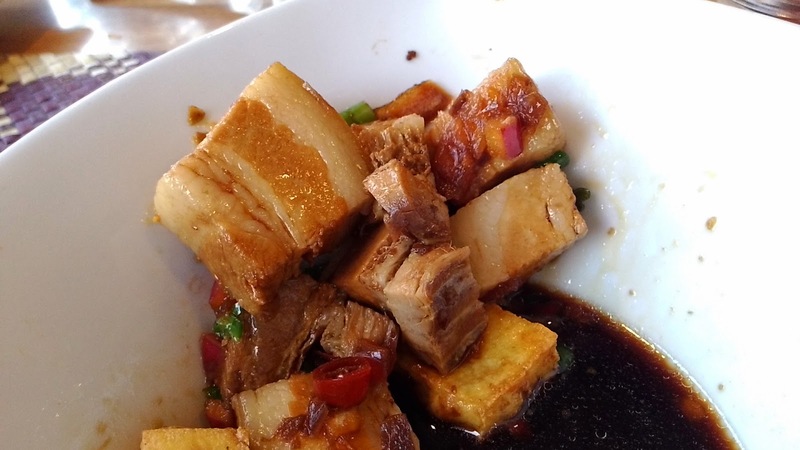 The pork belly was cut into ideal pieces and maintained its tender crunch. When tossed in the house-blend sauce, the vinegar helped reducing the heavy taste of pork belly fat and the grease from being deep fried. A simple dish done well. 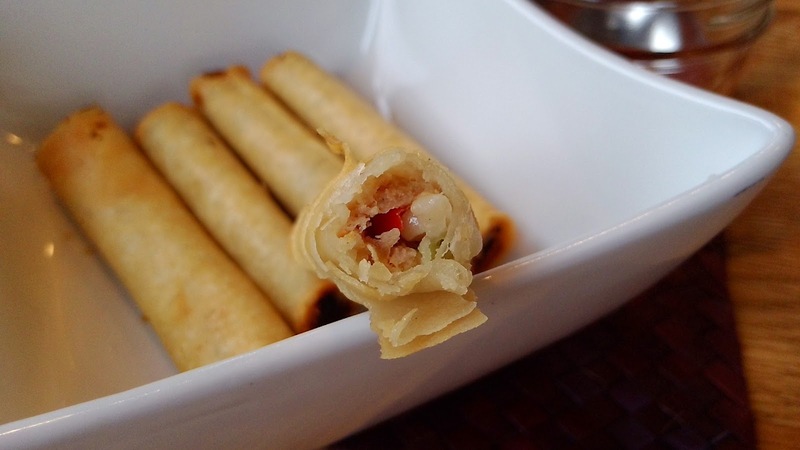 Since Buddha Boy and I are more used to the Chinese/Vietnamese-style spring rolls (where the rolls are more plump and meaty), it's really not fair for us to judge their Lumpiang Shanghai (spring roll). Personally, we thought the meat filling was a bit over-seasoned and the wrap was a bit doughy (too many layers). That being said, this could be the way how it's done in Filipino cuisine. While this was the weaker dish of our visit, the price point was quite reasonable. 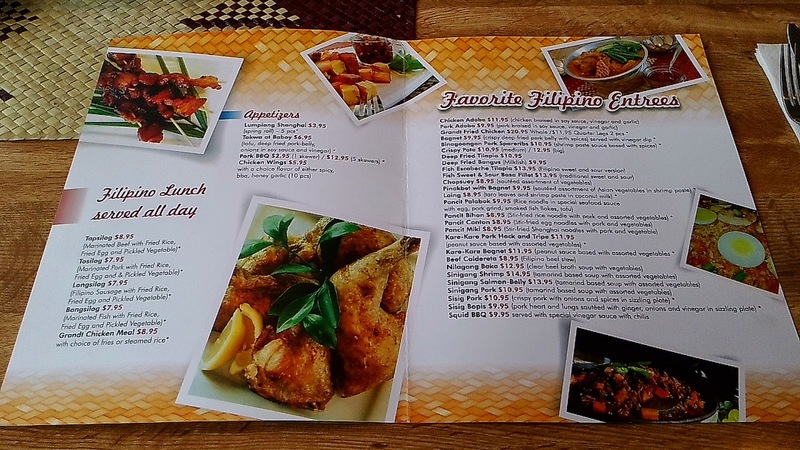 From their Filipino Lunch menu, Buddha Boy ordered the Grandt Chicken Meal. This came with a choice of fries or rice. Buddha Boy was expecting some kind of under-seasoned dry meat...but he was so wrong. The chicken skin was crispy and light. 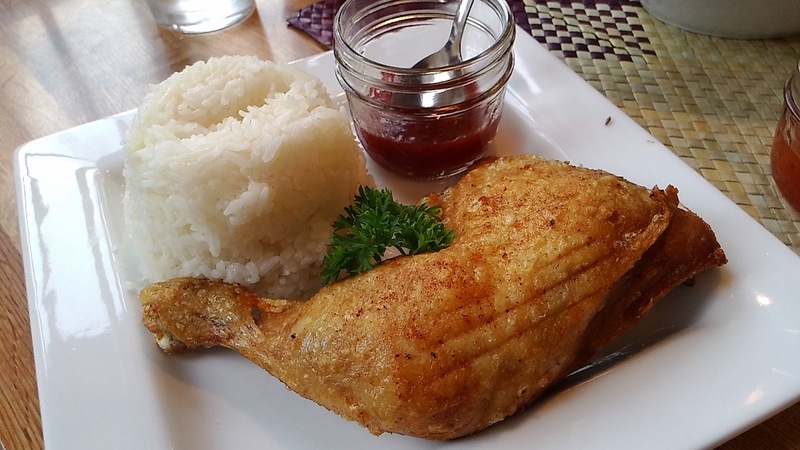 The moist and tender meat was seasoned perfectly that even if no sauce was used, the chicken would still be flavorful enough to eat on its own or with white rice. The sauce was really just for those who needed that little extra sweetness. 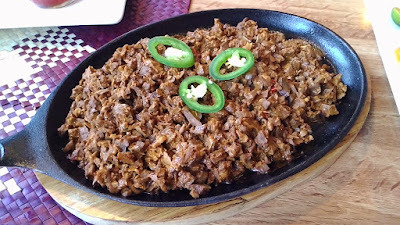 Sisig Bopis (pork heart and lungs sauteed with ginger, onions and vinegar in sizzling plate) was one of the two dishes I came here for. 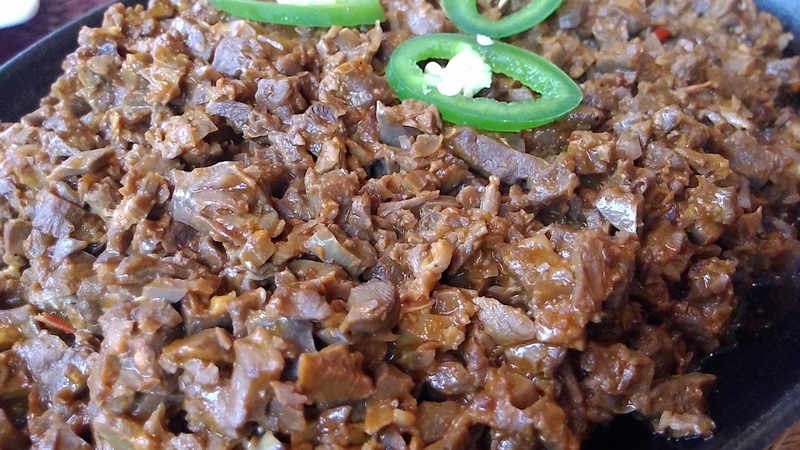 After placing our order, one owner (who seemed to be mostly in the kitchen) came by our table to confirm that we wanted a sizzling plate of pork guts (in this case, pork heart and pork lung). We thought this was a good approach as some people may get sisig pork and sisig bopis mixed up. This will also reduce waste. 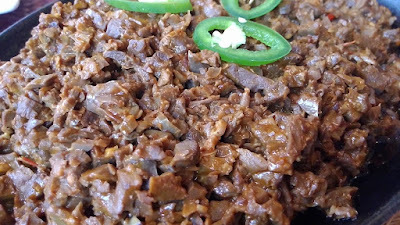 The guts were nicely diced so that the heart/lung texture could still be detected in each bite. To some people, this could be a bit gamy as the smell and taste of inner guts are often not the most pleasant. While this was an enjoyable dish and went well with rice, I'd prefer a stronger presence of ginger and onions. 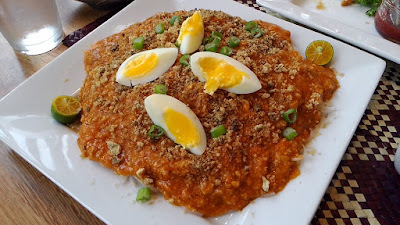 Pancit Palabok (rice noodles in special seafood sauce with egg, pork grind, smoked fish flakes, tofu) was my other must-try dish. The noodle texture was firm and chewy, similar to the traditional style of Cantonese lai-fen rice noodles 瀨粉. Appearance wise, the noodles were similar to the famous Taiwan Hsinchu rice vermicelli 新竹米粉. 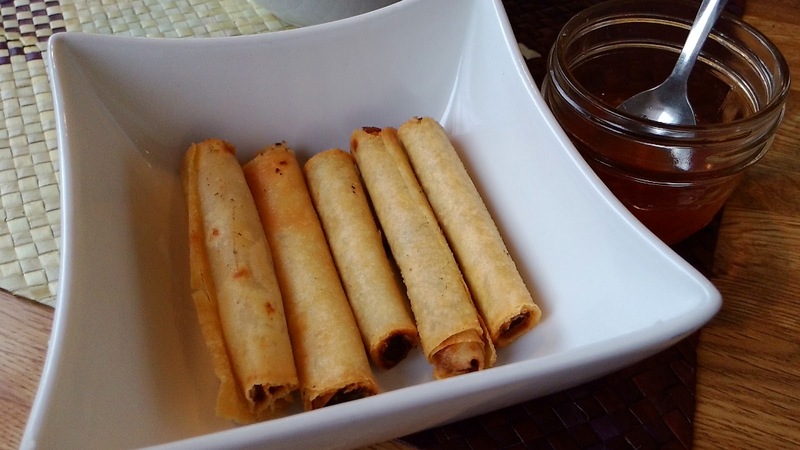 The smoked fish flakes gave the sauce a strong dried seafood taste and the pork crackling gave it a soft porky tone. Tofu was there, but only acted as a textured filler. The egg was cooked nicely with the yolk being soft and gooey. One kalamansi (Calamondin) was cut in half and place at opposite ends of the plate. 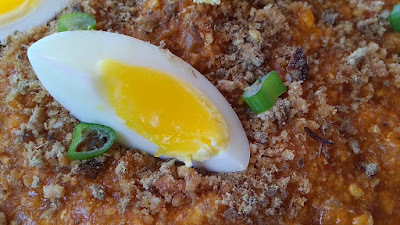 Was this the best pancit palabok I've had? No, but it's surely sitting near the top of my list. The portion was good for its price. I would definitely order this again. Dessert time! One owner (who tends the kitchen) came by and told us that the large group took his last orders buko pandan. 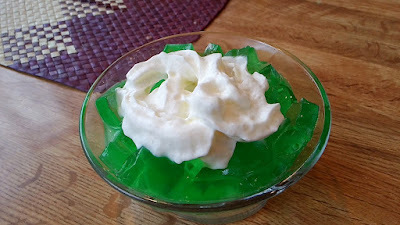 Knowing that I really wanted pandan jello, he made me something similar. I don't know the name of this, but I really enjoyed it! What intrigued me was the pandan jello, which, compared to the ones I have tried previously, had a stronger fragrance of pandan leaves. Beneath the green jello lies a bed of young coconut chunks...and boy, they were not stingy about it. While it was a bit too sweet for Buddha Boy, I thought this had just the right amount of sweetness. Considering that the restaurant is located in the industrial area, wouldn't it be ideal to open really early? Especially with such reasonable prices for breakfast? Not in this case. With their operating hours being 9am-7pm (Tuesdays to Fridays), seems to me that their main focus is the lunch crowd, not breakfast. Often, on Saturdays, Buddha Boy and I would wake up early and hit Fraser Park at about 7:30am for breakfast. 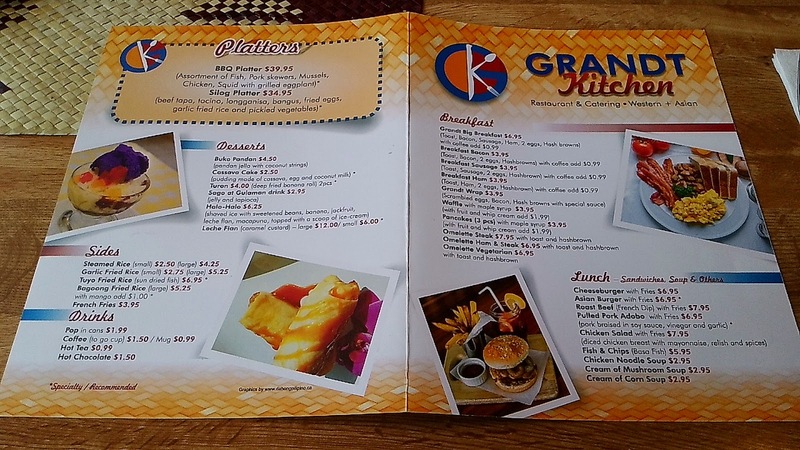 With their operating hours from 11am-8pm on Saturdays and Sundays, our breakfast date would not work at Grandt Kitchen. As I mentioned earlier, we are no experts in Filipino cuisine, but we do enjoy the food and the friendly approach from the owners and/or the diners. Homey, is the best word to describe our experience at Grandt Kitchen. Three couples, attending the same church and sharing the same passion, got together and opened this comfy and cozy restaurant in Surrey's Whalley area. What earned our utmost respect was their dedication - partial sales from their business will be donated to their church for missionary work. Now that's noble. An adorable elderly gentleman in the large Filipino group asked us if we're brother/sister. He apologized when we told him we're husband/wife. Honestly, this did not bother us, but we could tell that he felt a bit embarrassed for asking that question. After we joked and said "we're fat, and fat people look alike", this cute uncle began chatting with us. This incident actually made us felt like home. We enjoyed the company. Thanks for reading my blogs. Enjoy!